Test your Musical Knowledge with Rock & Roll Bingo! No entry free & Prizes for the winners! $2 cans and 1/2 price Wings. Hosted by Josh Alton. LET'S GET READY FOR RAGBRAI! Bring your RAGBRAI Team down on your RAGBRAI bus or Ride your Bike to Sully's! For those on a bus or bike, receive $7 Bud & Bud Light Pitchers & $3.50 Big Grove Tailwind Ale (collectors can) - a beer developed just for Ragbrai!!!! Come for bike-themed GIVE-AWAYS and PRIZES for best bus and best team shirts! 4-8 pm. Prizes awarded at 8pm. 21 and over event. Bus parking suggestions: Casey's, West Bank, Old Sully's Parking Lot, North of Dollar Tree. Please do NOT parking in True Value, Dollar Tree or Autozone parking lots. Drop off first & drive by for bus contest! Join us for lively Irish Pub Music with Stu Ryan O'Brien the 4th Wednesday of every month at 7pm! Enjoy $2 Cans and 1/2 price Wings. No Cover! The Friendly Sons are hosting their 36th Annual Run/Walk. Gather at Sully's Irish Pub at 9:30am for a warm-up drink and any last-minute registrations. Run starts at 11am. This is the only St Pats run in town where proceeds go to LOCAL charities! Packet pick-up at Sully's on April 13th 2-5pm or April 14th 9:30-10:45am. Registration includes an Irish-design long-sleeve t-shirt & food/beverage served after the race. Results will be announced at Sully's after the race. Post-race celebration continues at Sully's all afternoon! Thank Goodness - Baseball is Back! Catch the Chicago Cubs Home Opener at 1:20 pm. We will have $4 Sullys Dogs, Old Style specials and some awesome Cubs Give-aways from 1pm-5pm. $3 fireballs and $4 silos during the game! At the half, we will draw for one lucky table number, who will receive a free round of drinks (whatever you've been drinking) and a free appetizer (sampler excluded)! $3 fireballs and $4 silos during the games! 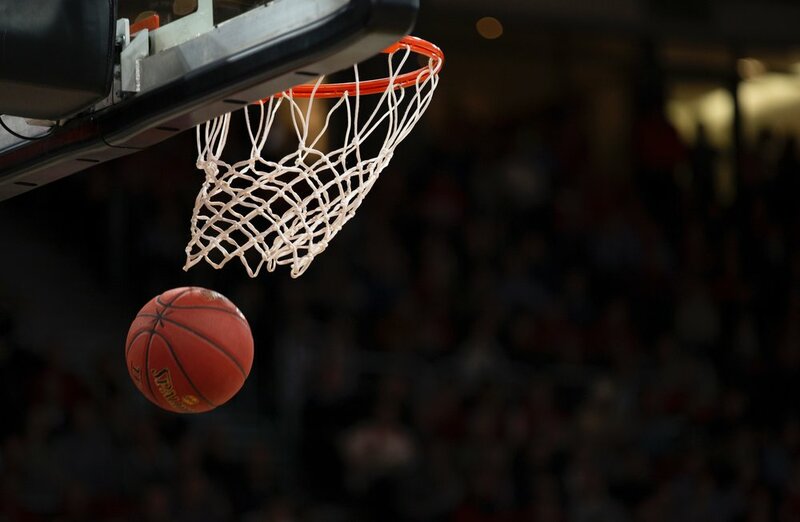 At the half of each game, we will draw for one lucky table number, who will receive a free round of drinks (whatever you've been drinking) and a free appetizer (sampler excluded)! Baseball season is here again! Catch the Chicago Cubs Season Opener at 3:05 pm. We will have $4 Sullys Dogs, Old Style specials, some awesome Cubs Give-aways and our normal 2-for-1 Thursday drink specials! Sullys Dog and Old Style Specials apply from 3pm-7pm. 2-for-1's are all day/all night. 11am: Heated tent opens. No cover! First 500 people in the tent receive free custom St. Patrick's Day koozies! Give-aways all evening! Ask for our special Leprechaun Piss or Leprechaun Kiss shots! King Kybo - your own private kybo for you & your friends! A free shuttle will run from 10am-4pm between Sully's, Mickey Finn's, Front Row and The Hall. Park at any of these locations and visit all of them! Kids are allowed until the bagpipers leave. After that, the party is 21 and over. CASH ONLY ACCEPTED ON ST PATS! NO CREDIT CARDS, GIFT CERTIFICATES, 2-FOR-1 CARDS OR COINS. AN ATM TRAILER IS PROVIDED. To GEAR up for St. Patrick's Day, ride your bike to Des Moines’ Premier Irish Bars and receive give-aways, drink specials and prizes for the top Irish costumes! Starting Location is either Sully’s (860 1st Street, WDM) or Mickey Finn's at noon (7020 Douglas Ave). If starting at Sully’s, leave at noon to ride to Mickey Finn’s. Prizes will be awarded for the top 3 costumes after everyone arrives at Sully's, approx 5:30pm. All four bars will offer $3 Fireballs, and $3 16-oz Bud & Bud Light Aluminums from noon to 6pm! Take Grand east 1 block across 63rd Street to Walnut Creek Trail. North on the trail until it hooks up with Colby Woods Trail. Follow that trail north of Hickman. After crossing Walnut Creek, take a left, then jog right to N. Walnut Creek Drive. Jog right to Roseland Drive and follow Roseland northeast to 70th Street. Left on 70th. Left at Mickey Finn’s on Douglas. Go out the back parking lot of Mickey Finn’s, west on Monroe. Take Monroe west. Montor turns into 74th Street as it heads south. The first right after Karen Acres Elementary School is Roseland Drive. Take a right on Roseland Drive. Follow Roseland down to N. Walnut Creek Drive and jog left on Walnut Creek Drive, then a quick right to connect to Colby Woods Trail. Take the first right on Colby Woods Trail to cross Walnut Creek then take the next first right to hook up with 82nd Place. You will see the back of Groucho’s from 82nd Place. Get back onto 82nd Place and follow that south to Harbach. Right on Harbach. Harbach to 86th. Right to Ducktail. 86th south to Clive Greenbelt Trail. Follow Greenbelt Trail to Walnut Creek Trail. Get off Walnut Creek Trail at Grand and take Grand west over 63rd Street to Sully’s. 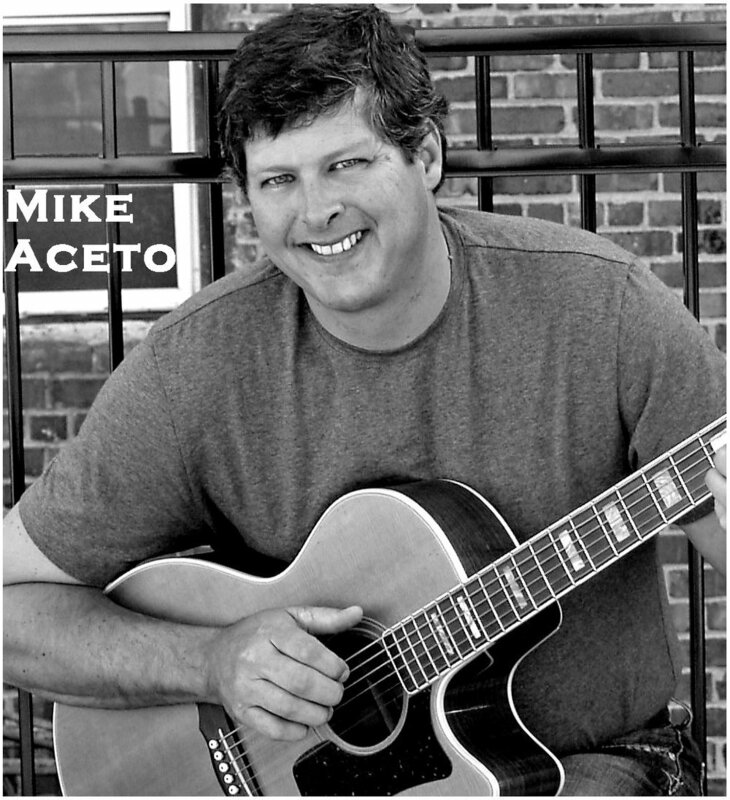 Mike Aceto performing live! No cover! $2 Cans o'Beer and 1/2 price wings! Sully’s will host the final Hawkeye Game Watch for the season. Doors open at 10am. Specials include $2 Domestic Draws, Bottles, Wells, $6 Domestic Pitchers, $3 Fireballs and $4 Irish Dogs during game-time. There will be a final prize raffle at half-time and give-aways, including a free six-pack to a lucky winner every time Iowa scores a touchdown! We will also draw for our end-of-season raffle for several large grand prizes, including a TV and a Mexico Trip (must be present to win, same person cannot win more than one of the large prizes). Entries for this raffle closed at the last regular season game. GO HAWKS! Sully’s will host an Iowa State Bowl Game Watch! Specials include $2 Domestic Draws, Bottles, Wells, $6 Domestic Pitchers and $3 Fireballs during the game. GO STATE! 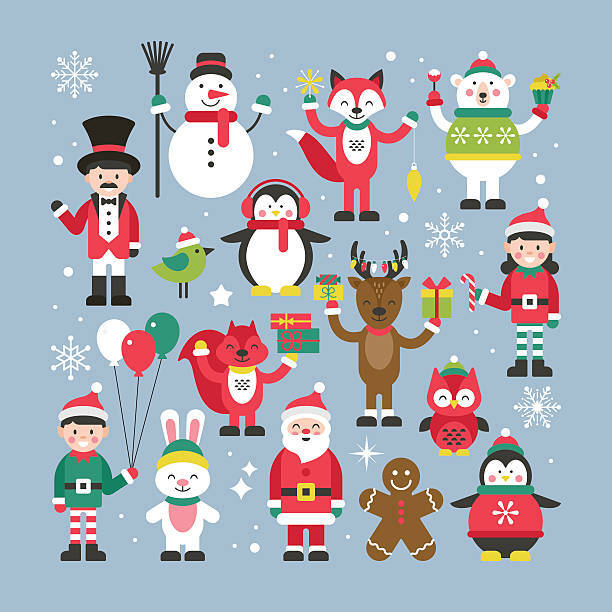 Dress up as your favorite Christmas character to celebrate the season!!! Come help us start the official countdown to St. Patricks Day 2019! $3.00 16-oz Bud & Bud Light aluminums & $3.00 Fireballs! First 100 people receive free 2018 St Pats Koozies! Register to win one of several awesome prizes – including a Budweiser Happy Hour Party and a 7-NIGHT STAY IN MEXICO! Drawings from 9-10pm and must be present to win. 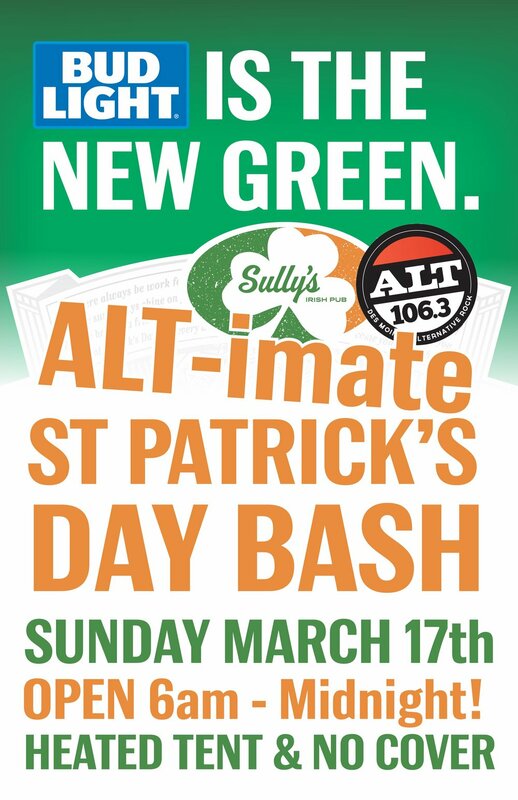 Alt 106.3 and Doll Distributing will be on hand for some give-aways and samples! Visit alt1063.com between 11/19-11/27 to enter an online contest for a VIP table at the party! Sully's hosts a Hawkeye Game Watch for every Hawkeye Football game! Specials include $2 Domestic Draws, Bottles, Wells, $6 Domestic Pitchers, $3 Fireballs and food specials during game-time. Each game will have a prize raffle and give-aways, including a free six-pack to a lucky winner every time Iowa scores a touchdown! Also put your name in for an additional end-of-season raffle for several large grand prizes. GO HAWKS!